• Anna R. Kuehl, 27, 823 Sunrise Dr., New Ulm, was convicted of felony second-degree assault-dangerous weapon, two counts of fourth-degree assault of a peace officer, and fourth-degree assalt. Charges of domestic assault-by strangulation and subsequent violation were dismissed. She was sentenced to 33 months at the Shakopee Correctional Facility, stayed for seven years Supervised probation, monitored by the Mn Department of Corrections, Field Services. For the first conviction, conditions include completing inpatient chemical therapy treatment with any remaining executed jail time being stayed, obtain and follow all Mental Health Assessment recommendations, attend at least 10 Sober Support meetings, verify to probation, complete anger management/domestic violence-specific therapy services, verify to agent, comply with Alco-Sensor monitoring as directed by agent, do not use or possess firearms, ammunition or explosives, no contact with victims. For the second and third convictions, she was sentenced to the Shakopee Correctional Facility for 15 months, stayed for three years Supervised probation. 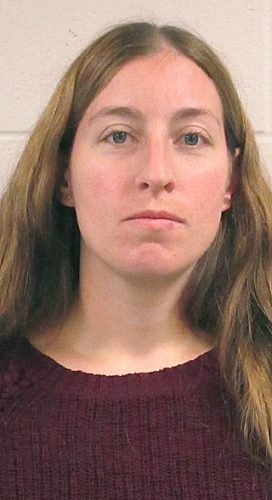 For the fourth conviction, she was sentenced to 365 days in the Brown County Jail, 185 days stayed for two years Supervised probation. She was credited with 96 days served.